Way back in 1996, Nintendo announced that one of its first titles, to appear during Spring Training '97, would be Ken Griffey Jr. Baseball. (KGB) A year and a half later, it's finally materialized. Worth the wait? Read on. All things considered, the graphics in MLB: Featuring Ken Griffey Jr. are quite solid, with detailed animations and relatively good touches such as fully rendered stadiums, a variety of batting stances, crowd reactions, team celebrations, and even coaching signs. However, the excessive use of filters leaves the game with an occasionally blurred or unfinished look. My favorite aspect of the graphics would have to be the 30 different major league ball parks, which are all distinguishable to the true baseball fan. The only gaping flaw, however, lies in the awkward batting stances and unnatural pitch deliveries. The man at the plate often appears to have tiny arms and abnormal swings due to the angle of their elbows or the over-exaggerated crouch. The timing on the swing is also a little bit off, leaving the impression that a ball that appears to have been off the end of the bat will ususally result in a home run. However, I feel that although many of these features might dissuade a serious baseball fan from purchasing the game, a more casual fan might prefer the arcade-type style and graphics, as opposed to the ultra-realistic All-Star Basball '99 produced by Acclaim. MLB Featuring Ken Griffey Jr. is far better than Mike Piazza's Strike Zone, but cannot measure up to All-Star '99. One thing that KGB has going for it is the excellent use of camera angles, which truly deliver the best possible angle during every hit, pitch, and most importantly home run. It is possible that due to over-anticipation I criticize the game so harshly, but on the other hand, I have played All-Star Baseball 99. Once again KGB fell below this reviewer's high expectations. On the positive side, I truly enjoyed the crowd cheering, the crack of the bat, the post-homerun fireworks, and especially the occasional ambulence sirens. If the home team is being destroyed, the crowd will diminish, and become very quiet, which adds an interesting dimension to the game. The only thing that truly annoyed me about this game was the commentary by Ken Griffey Jr. himself. His comments are irritating and often inappropriate. For example, an AI pitcher had become very fatigued and had been beaten for 9 runs already that inning. After finally striking out a bored human opponent with a pitch of 48 miles per hour, Griffey pipes in with the comment "that guy's got heat." These comments can (and should) be turned off because they only detract from the otherwise fine audio. KGB takes a slightly different approach from the typical interface by utilizing a rotating baseball to select from a variety of options including: Home Run Derby, Exhibtion game, Season, or Playoff series. I like the ability to check the sports wire for transactions, but the lack of stat-keeping is borderline inexcusable for the true baseball fan, but may be fine for someone just looking for a fast-paced, arcade type of game. None of the options are difficult to access, such as pitching changes and pinch hitters. 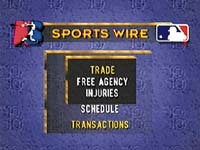 MLB Featuring Ken Griffey Jr. covers the bare essentials well enough, but leaves out features such as create-a-player, which could elevate the game beyond its current level. I was disappointed with the lack of options, and even more disappointed when I noticed it was not possible to quit during game play aside from using the reset button. Many of these details can be considered insignificant to some, but are greatly appreciated by others such as myself. 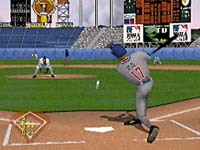 MLB Featuring Ken Griffey Jr. has solid gameplay, but does not offer anything above and beyond what gamers have come to expect with the N64 technology. It has some nice AI touches such as stolen bases, player substitutions, etc. but also several flaws. KGB does have fast, arcade game play, but truly lacks in realism. What bothered me the most was the inability to switch fielders once the ball has been hit. Often times I have wanted to use my shortstop to field a grounder, but the only result is that my 3rd baseman moves further away from the ball beacuse only the computer can determine the player you control. The use of moving the cursor to align the swing to the pitch is an innovative idea, but not exclusive to KGB. All-Star Baseball '99 utilizes the same technology, but Mike Piazza's Strike Zone does not. MLB Featuring Ken Griffey Jr. can also be played in "classic mode" which constitutes the removal of the cursor hitting and leaving it up to your timing. I feel classic mode detracts a lot from the strategic gameplay, and results in an unfulfilling gaming experience. If one aspect of KGB makes it a good rental instead of a sound purchase it is the ultra simple AI. It is not uncommon to score over 25 runs in a single game, and the difference between Rookie, Veteran, and All-star is minimal. The computer team is always too late to bring in a relief pitcher or insert a pinch hitter which makes the game inadequate in the 1 player mode. I also detest the ease with which players can reach 1st base. Strikeouts are minimal no matter what pitcher is on the mound, and almost every second pitch is at least a base hit, if not a double. However, since AI is a non-factor in multiplayer mode, I suggest you get some friends together and rent it, rather than keeping it for the long haul. As I see it, the situation concerning MLB Featuring Ken Griffey Jr. is very simple. It is almost ideal for the gamer seeking a fast-paced, arcade style game, rather than a realistic experience. 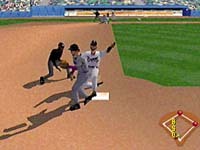 If realism is your big issue, I strongly recommend All-Star Baseball '99. MLB Featuring Ken Griffey Jr. simply can not compare in terms of graphics, but is not without merit.